The impact of losses on an investment portfolio can be devastating and the ability to create wealth after significant losses is greatly diminished. For example, the S&P 500 lost over 49% of its value during the bear market from 2000 to 2002. It took five years (October 2002 to October 2007) to recoup those losses. Unfortunately, as soon as the S&P 500 recouped the losses it started to decline again during the most recent market downturn. The S&P 500 lost over 56% from October 2007 to March 2009. Someone with a $100,000 portfolio invested in a large cap stock portfolio as represented by the S&P 500 in March 2000 would have approximately $70,000 at the end of September 2009. Why are these losses so devastating? There are two factors working against a “buy and hold” or what we like to call the “buy and hope” investor that hampers the ability to create wealth and fight inflation. First of all, the ability to recover losses is exponential. A 10% loss requires an 11.11% gain to break even. A 50% loss requires a 100% gain to break even. A loss of 70% requires a 300% gain to break even. 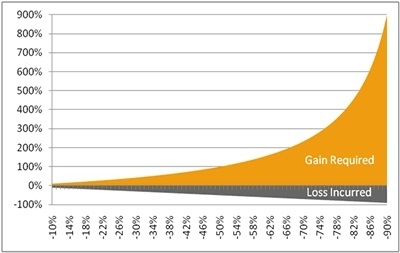 Losses (gray) become exponentially more difficult to recover as the loss increases. Second is the issue of time. Who has the time to wait to recover from these types of losses? The “buy and hold” investor with $100,000 invested in large cap stocks similar to the S&P 500 in March 2000 would still be 30% down after more than 9 years. By the way, this remaining 30% loss would require another 42% gain to just break even!! Avoiding these types of losses allows any subsequent bull markets to create wealth instead of recouping losses and will provide better protection from inflation. At RGB Capital Group, we strive to minimize the impact of these declines by getting out of harm's way. Although there is no guarantee we will jump out at the top and get back in at the bottom, we strive to recognize the changes in major trends and keep our clients away from these devastating losses.